Whether you’re totally new to the world of Internet radio, or you’ve been listening on your computer for years, getting Pandora on your car radio is surprisingly easy. In fact, some cars now come with Pandora functionality baked right in. If you don't already have that (most cars don't, yet), you can buy aftermarket car radios that include Pandora, or you can even use a cell phone that you already carry around anyway to add Pandora to virtually any car stereo system. The method you ultimately use to listen to Pandora in your car will depend on the hardware you’re working with and whether or not you want to spend any money. Depending on how your mobile data plan is structured, you may also have to take bandwidth and audio quality into consideration. Pandora is an Internet radio service that uses an ingenious algorithm to create custom stations that are personalized to your own tastes. The way it works is that you select one or more songs to act as seeds for a new station, and the algorithm automatically picks other songs that it thinks you will like. You are then able to provide feedback on whether or not a specific song is a good fit, which allows the algorithm to fine-tune the station even further. While the basic Pandora service is totally free, there are a number of limitations placed on free accounts. For instance, a free Pandora account can only stream a limited number of hours of music each month. Free accounts are also limited in other ways, such as only allowing you to skip a handful of songs each hour. If you opt to pay a monthly subscription fee, Pandora will allow you to skip any track that you don’t want to listen to without any limits. The paid subscription also does away with the advertising that free accounts are subject to. While Pandora started out as a browser-based service that required a desktop or laptop computer, it is now available on mobile devices via an official app. That means you can access all of your desktop playlists via your smartphone or a compatible Pandora car stereo. How Does Pandora Work on a Car Radio? The two main ways that Pandora works on car radios are via a baked-in car radio app or through a smartphone and an auxiliary jack of some sort. In both cases, the services rely on a smartphone with an active data connection to actually stream the music. Car radios with integrated Pandora functionality work by connecting an app on the radio to an app on a smartphone. Depending on the smartphone in question, this connection may be via USB (that is, a physical wire) or Bluetooth. In any case, the connection allows you to control Pandora via your car stereo, and even by steering wheel controls or voice commands in some cases. When a car radio doesn’t have integrated Pandora functionality, the process is a little different. You still use a smartphone with a Pandora app to stream your stations, but you aren’t able to control playback via your head unit, voice commands, or steering wheel controls. You also need an auxiliary jack or USB connection, Bluetooth, or some other means to actually transmit audio from your phone to your car stereo. While the number of car radios that come with an integrated Pandora app is definitely limited, Pandora states that the functionality is available across more than 170 vehicle models. So if you bought your car recently, there’s a chance that you already have built-in Pandora functionality. If you aren’t sure whether your car already has a Pandora app, you should be able to find out in your owner’s manual. Pandora also maintains a list of vehicle models and aftermarket radios that include integration. The process of setting your car radio up so that you can listen to Pandora stations on the road will be a little bit different depending on whether or not your car radio has an integrated app. If your radio does have an integrated Pandora app, then all you have to do is open that app, download the corresponding app on your smartphone, and sign into your account. At a bare minimum, connecting the app on your radio to the app on your phone will allow you to stream music and control playback via the head unit controls. If your car supports it, you will also be able to skip tracks, give a thumbs up or thumbs down to individual songs, change stations, and more. If your car radio doesn’t have an integrated app, you can still listen to Pandora in your car, but it may be more complicated. Depending on how your car radio is set up, you may be able to use an auxiliary jack, USB, or a Bluetooth connection. If your head unit doesn’t work with any of those options, you can also use an FM transmitter or FM modulator to use Pandora with virtually any car radio. Regardless of the way you choose to connect your phone to your car stereo, this method of listening to Pandora on your car radio requires you to control the app directly via your phone. Since there is no real integration with your car radio, you’ll have to skip tracks, select stations, and do everything else on your phone. How Much Data Does Pandora Car Radio Use? Since listening to Pandora on your car radio requires a phone with a data connection, mobile data usage can be a real concern. 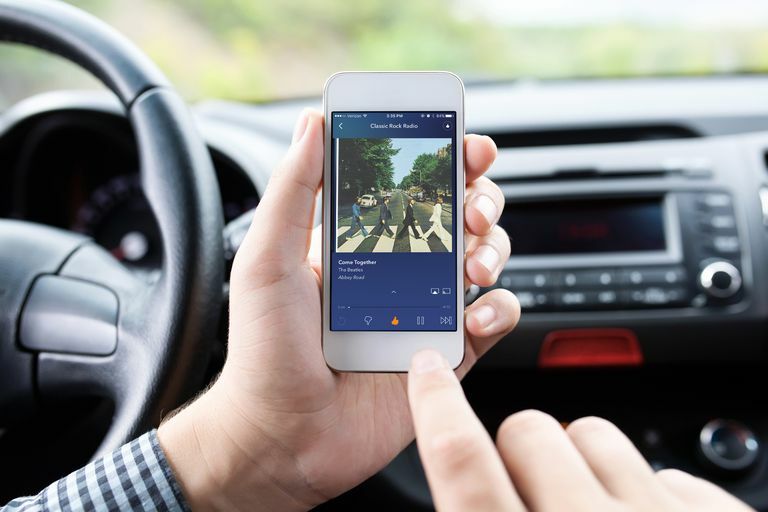 Whether your car has Pandora integration, or you choose to connect your phone to your stereo via an auxiliary jack, your phone will still eat up data whenever music is playing. Some services, like Spotify, allow paid accounts to download music at home for offline use. Pandora doesn’t currently offer any option like that, but the mobile app does take data into consideration whenever you’re away from Wi-Fi. That basically means that Pandora defaults to lower audio quality, and smaller file sizes, when you’re on a mobile data network. You can also choose to use a slightly higher quality setting of 64 Kbps. This is still extremely lightweight in the world of digital music, to the point where listening to one hour of Pandora would only eat through about 28.8 MB of data. At that rate, you could listen to more than an hour each day all month before cracking a 1 GB data plan. If mobile data use is a big concern, some carriers offer data plans where content streamed from certain providers doesn’t count against your limit. So if your provider offers a plan like that, or you’re willing to switch, you can listen to as much Pandora radio in your car as you like without worrying about going over your data limit. How Does Pandora Sound on a Car Radio? While Pandora’s lightweight bitrate means you can listen to a lot of music without burning through all your mobile data, a lower bitrate does mean lower quality audio. HD Radio FM broadcasts use a bitrate of between 96 and 144 Kbps, and MP3 files typically range between 128 and 256 Kbps. In both cases, even Pandora’s 64 Kbps option pales in comparison. What that means is that Pandora is more likely to suffer from compression artifacts or sound tinny. Whether or not you actually notice any of this, in practice, depends on your sound system and the listening environment in your car. If you have a high-end car audio system, and your vehicle is well insulated against road noise, then you’re more likely to hear the difference between music streamed from Pandora and high-quality MP3s burned to a CD or loaded on a USB stick. However, that difference can evaporate quickly if you’re using a factory audio system and deal with a lot of road noise. Since there is no upfront cost associated with listening to Pandora in your car, the good news is that you can make the decision for yourself as to whether or not it sounds good to your ears. If you decide that a 64 Kbps audio stream just doesn’t sound good enough in your car, you can always opt for a higher fidelity option. Just remember that you’ll have to either bump up your data plan or forgo streaming in favor of a service that offers an option to download music for offline listening.